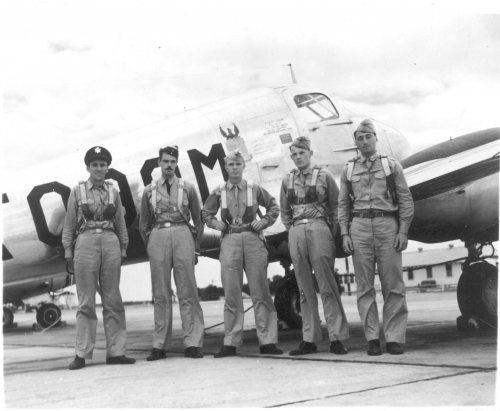 *** Listed on John P. Ernst MACR (#12046) and Casualty Report -- Flying as Command Pilot. 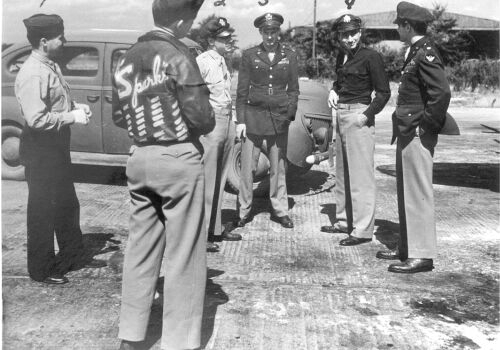 SGT'S JAMES F. MACK AND M.J. SHELDON REPLACED DARLING AND SCHAFFER. Sept 28, 1943-Mar 5, 1944      418th BS, 100th BG (H) ETOUSAAF (8AF) [European Theater of Operations, United States Army Air Force, Pilot B-17-300 hours-Flight Commander (1st Pilot), 25 c/m (combat missions) 240  c/hours (combat hours). 15 Squadron Leads,   5 Element,Leads and 5 Wing Leads. Group Training Officer. Set up policies for training of new crews, very little operational duty. 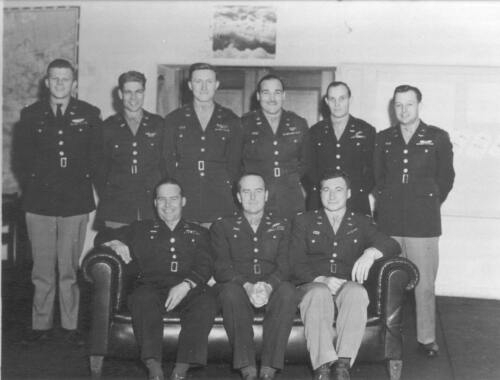 CO OF THE 350TH BS FROM LATE MAY 1944 TO SEPT 10, 1944. 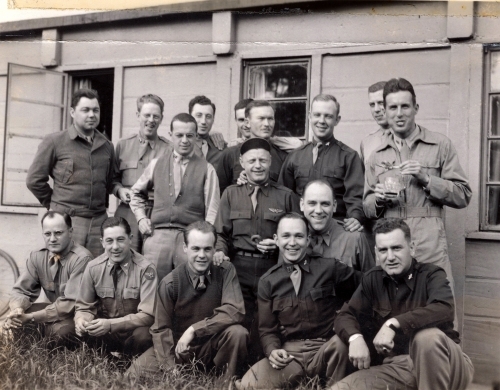 CO OF THE 418TH BS FROM ? 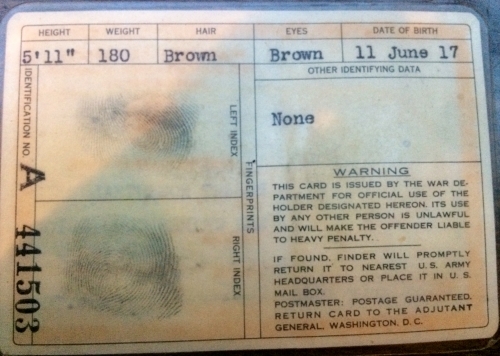 TO FEB 3, 1945. 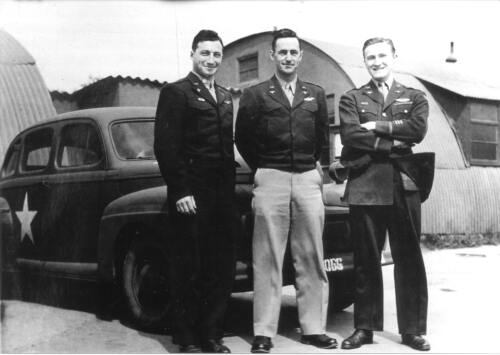 *10 SEP 44 THIS CREW WITH ROSENTHAL AS COMMAND PILOT CRASHED LANDED IN FRANCE. 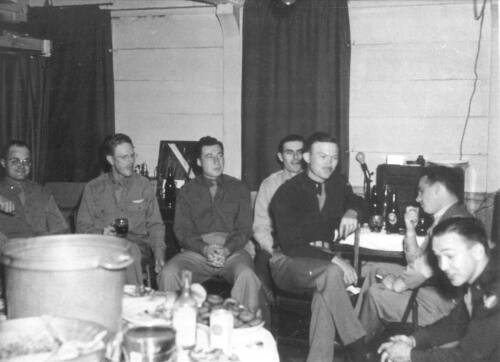 Ernst's leg amputated  in German Hospital night of 3/2/45 & he was soon exchanged. See "CONTRAILS" p.131 & S.O.C. p.95. 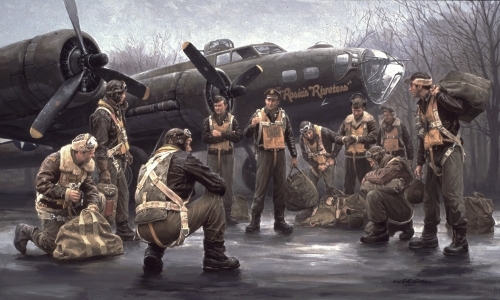 Also p.219/223 of "FLYING FORTRESS" by E.Jablonski. excellent chance to bail out." 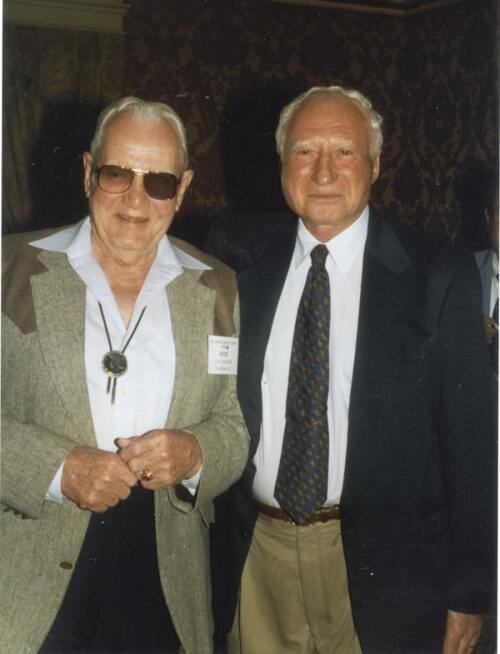 Robert Rosenthal is the best known of the 100th veterans and one of the better known airman in WWII. Fresh out of law school he enlisted in the U.S.Army, December 8th, 1941. Progressed rapidly through the Army Aviation pipe line and joined the 100th as a 1st pilot in August 1943, coming at the onset of some of the 100th more famous missions. 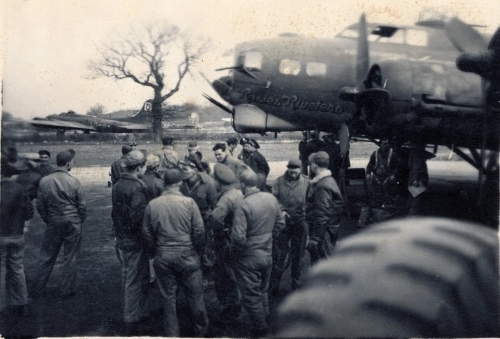 "Rosie", as he is known to all 100th veterans, started with the 100th Oct 8, 1943 trip to Bremen. 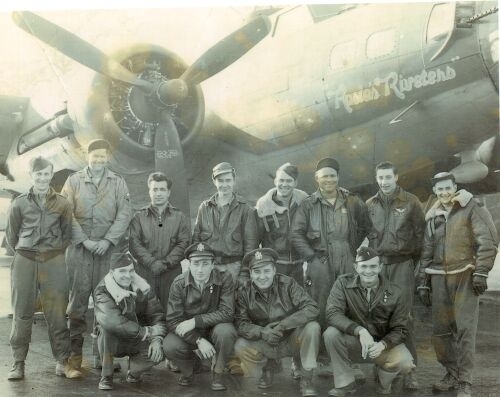 The 100th lost seven B-17s including the 351st's  Thomas Murphy in the famed Piccadily Lily. 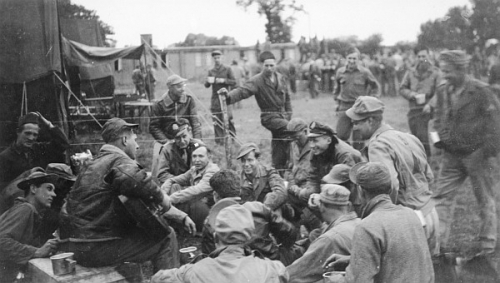 On the ninth of October, 43 the 100th went on the long mission to Marienburg and returned with no losses. 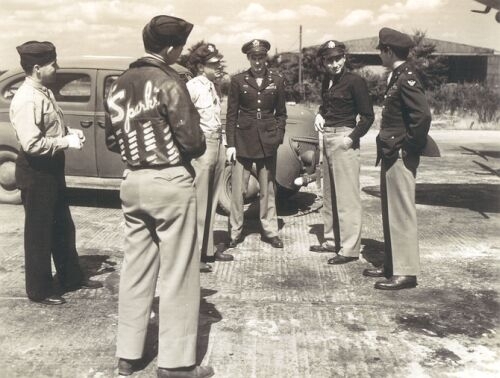 "The next day we met Robert 'Rosie' Rosenthal of the 'Bloody Hundredth' Bomb Group. 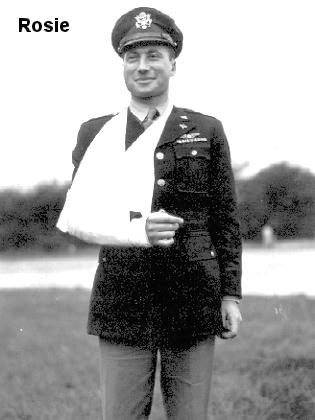 His right arm was in a sling due to being fractured in his bail out while flying his last mission." 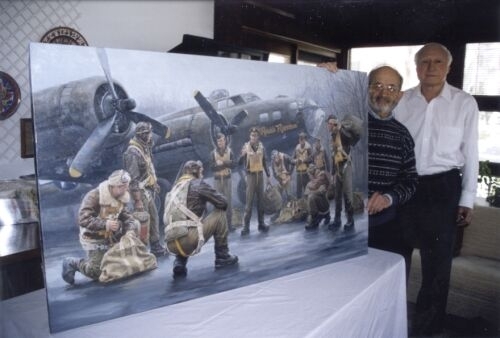 "Rosie had flown 50 missions with the 100th Bomb Group since arriving at Thrope Abbotts in October 1943." "The following day, our crew, with Rosie Rosenthal, travelled by train to Poltava where we were delayed about a week. 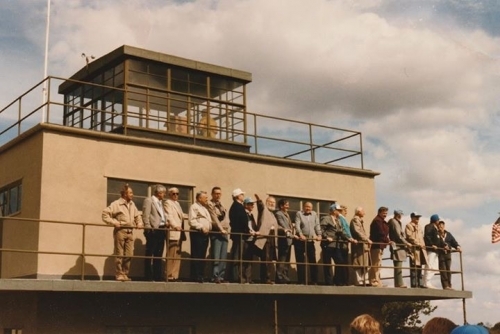 From Poltova we flew in a C-46 transport plane to Iran, where we stopped overnight." "Next morning we flew to Cairo, Egypt. 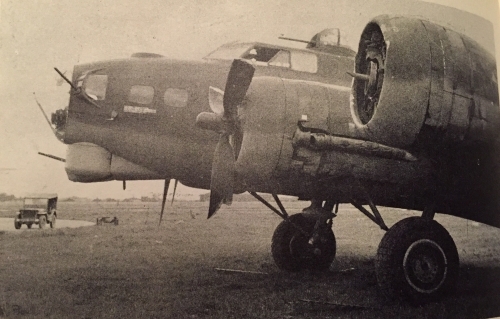 After three days in Cairo, we flew to El Adane, a British base, then to Athens, Greece; Naples, Italy, and Rome where we transferred into Winston Churchill's converted B-24 Liberator for the flight back to St Mawgan's, near Lands End in Southwest England. 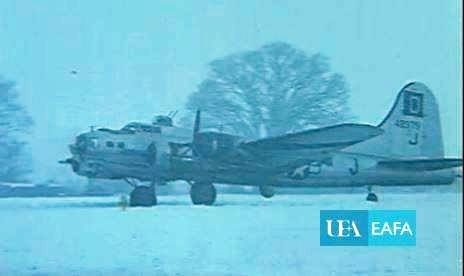 A US Navy DC-3 then flew us to Bovington Airfield. 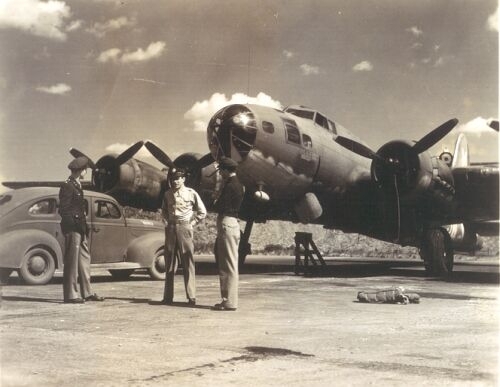 Here we were stranded until we found an abandoned B-17G parked out of sight in the back woods. 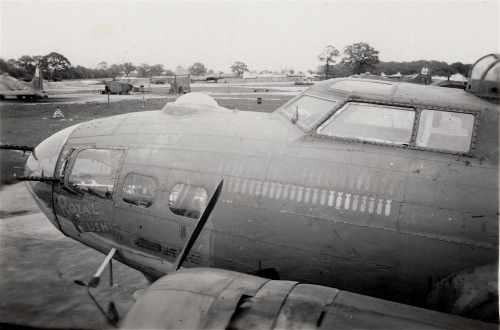 Its serial number was 43-38346;  we flew this airplane back to the 95th Bomb Group at Horham two days later." 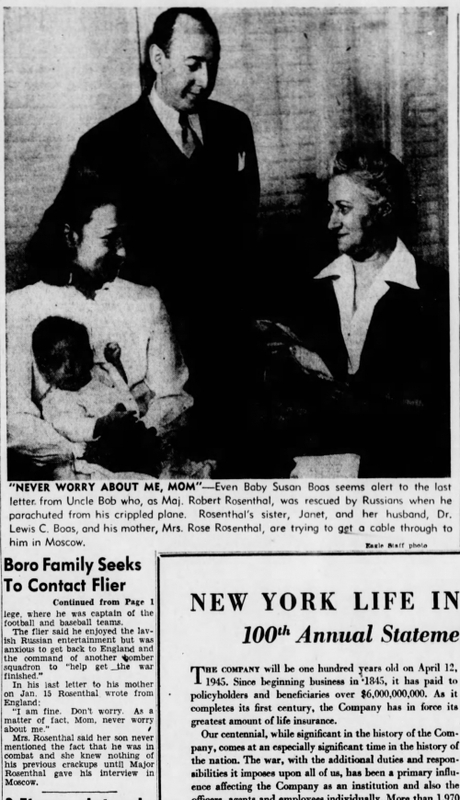 *Letter sent to Robert “Rosie” Rosenthal on March 17, 2001 by Bill DeBlasio, tail gunner on Rosie’s Crew with his recollections of the MUNSTER mission October 10, 1943. I did the best I could considering this fading memory of mine. Some parts of this mission stand out very clear to me, others such as where we were in the formation draw a blank. I haven’t had a “flash back” for about 7 years now, maybe they are behind me. I certainly hope so. They are a truly miserable 24 hours. I’ll close for now; I hope this is what you want. My Family has been trying for years to get me to write about this. I simply didn’t feel I could do it. 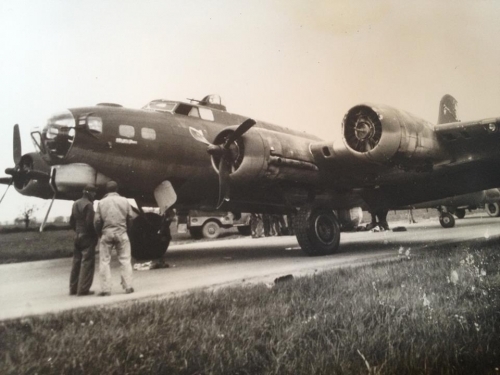 We arrived in England in September 1943 and were soon sent to the 100th Bomb Group, which was located near a small town named “Diss”. We flew our 1st mission to Bremen, our second to Marienburg, our third to Munster on the 8th, 9th, and 10th of October 1943. 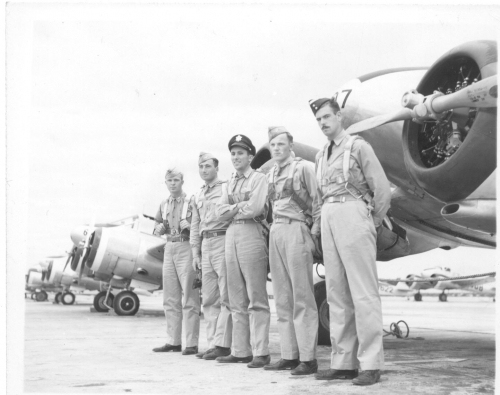 The 100th Bomb GP launched 13 aircraft this day and I do not recall what position in the group formation we were assigned. 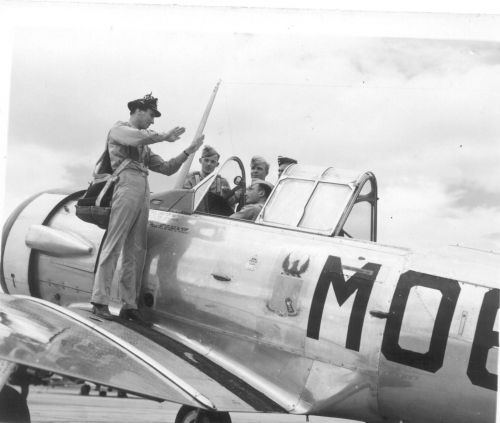 As yet, we were not assigned our own aircraft. Therefore we flew the one assigned to us; Royal Flush. If my memory serves me correctly, the briefing officer stated we were to bomb as much of the center of the city as possible. The theory behind this was; if the civilians were killed who would man the equipment to help fight the war. Seemed sound at the time. 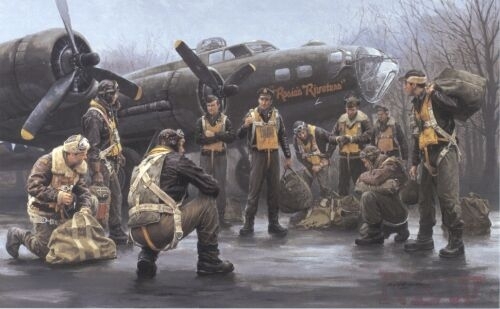 The Group as a whole ran into considerable flak but the fighters were much more of a threat by far then the flak. It has been said in numerous books that the Munster Mission was one of the hardest fought battles for both sides of the entire war and I for one am inclined to agree! 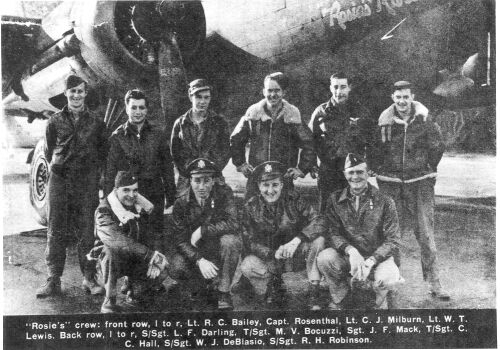 Twelve of the Groups aircraft were shot down either before bombs away or shortly thereafter, leaving the Royal Flush all by herself. I believe at one time we tried to attach our selves to the 95th Bomb GP for protection, however this did not last for long. Flak had knocked out one of the left engines as well as one on the right wing making it impossible to keep up with any formation. Once we were completely alone the fighters really started their attacks. I think at this time I should say what follows are through the tail gunners eyes as I was far to busy to look around. The fighters were very well coordinated and were coming in waves of four abreast. There were not firing until approximately 800 yards and neither was I.  I lined up on the number two man form my left and fired three short bursts. His left wing flew off over his plane and crashed into the plane to the outside. Both went down on fire. I then switched to their inside plane on the right and fired at him. Smoke started coming from the plane and the canopy came off, the plane rolled over ejecting the pilot. I couldn’t follow his plight as I had one more plane to deal with. Just as I brought my sights to bear on him, he peeled off to his left (my right). There was a period of about 4 or 5 minutes respite then they started again. I believe we may have been about 15 thousand feet as two Ju-88’s joined the fray, with two engines out there was no way we could maintain high altitude. Again there were 4 FW 190’s, only this time they were staggered more or less one behind the other, not in a straight line as were the first bunch. This time however the two Ju-88’s were on each end of the4 fighters making six aircraft lined up on us. For some unknown reason, I decided to try for the bigger aircraft first. I thought I noticed something hanging from the bottom of their aircraft. About that time, here come the rockets. A total of 8 rockets come at us in about 1 minute of time, all missed. It dawned on me that what I saw beneath the aircraft were their flaps. They needed to lower their flaps to give them a more stable platform for their rockets. I started firing at the Ju-88 on the left and soon he was on fire and sliding off on his right wing. The other aircraft had closed too within 600 yds and I just started raking my fire from left to right and back again. During this exchange two of the FW-190’s in the center crashed into each other, as I believe I hit them both at the same time. So we have a total of six planes shot down and we don’t know how many, if any, were damaged. About this time I believe you ordered me to fire off my remaining ammo and come out of the tail position. At this time we were below 10,000 ft and did not know if we were going to ditch or not. We began throwing anything that wasn’t nailed down out to lighten the aircraft. We were successful and didn’t ditch. June 4, 1943 Queen Mary docked at Fytle of Clyde, 18 Miles from Glasgow, Scottland. 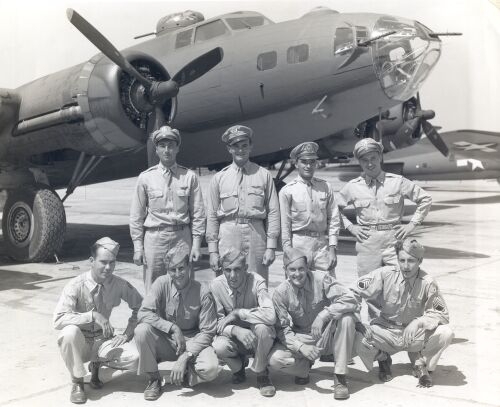 July 16, 1943 Arrived at 100th Bomb Group with 15 other Gunners. Oct. 10, 1943 MUNSTER!!! Rosies Riveters return alone. Luck was really with them. Every other ship was shot down. flak very heavy and accurate. Nov 26, 1943 Paris, France. Very little flak, clouds over target. Nov 29, 1943 Bremen, Ger. (second time) 7:45am-4:47pm. No ships lost. 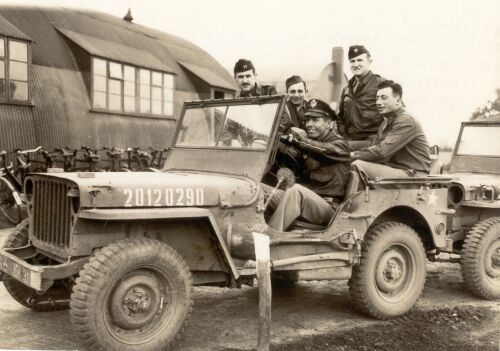 Nov 30, 1943 Solingen, Ger. 8:15am-2:30pm  -60 degrees. Oxygen system froze. Mike and Junior passed out. Dec 5, 1943 Bordeaux, France. 10 hrs in the air. came in O.K. thank god. Feb 4, 1944 Frankfurt, Ger. 8:05am-3:45pm  We had flak from the coast into target. Very nerve wracking. Crossed Ruhr Valley, 3 holes in ship. 2 ships fell out of formation and were shot down by FW 190's. Feb 10, 1944 Brunswick, Ger. 6:45-4:10. Heavy Fighter oppostion 30 FW's, 20 JU88's 2 Forts blew up when hit. Saw 15 forts go down. Feb 21, 1944 Brunswick & Alhorn Ger. 9:35-3:30. Good fighter support. Lost a fort over Holland. Feb 25, 1944 Regensburg, Ger. 8:15-6:15 demolished target (aircraft factory) saw the Alps & Danube River. (pretty country) lost 3 forts, 12 F.W. Bill McClelland(wounded)and Me still hanging around. Of the 85 of us to come over, there is now 15 left. 6 have finished. I'm still sweating them out. 7 more missions left to make. when within 40 miles of Berlin. 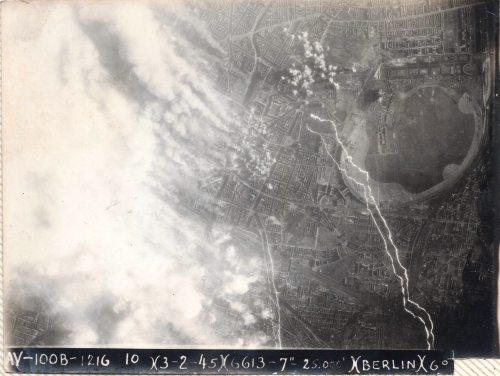 2 forts collided & blew up at 27,000 feet. was the last mission for my Crew and when we landed there was much rejoicing. We "Buzzed"
the field twice at tree top level. in the channel, flew with (Lt Harris) a good man. 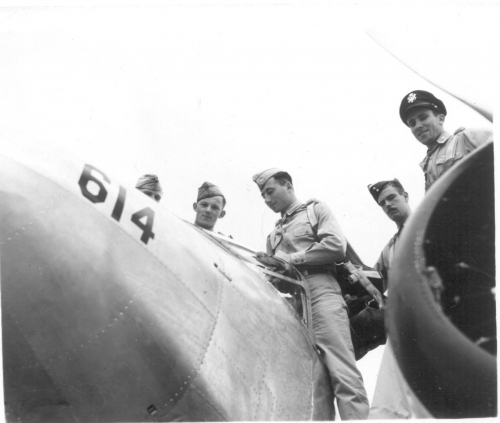 Apr 9, 1944 Posen, flew with Harris again. Started for Poland & were called back. Couldn't land because of fog. 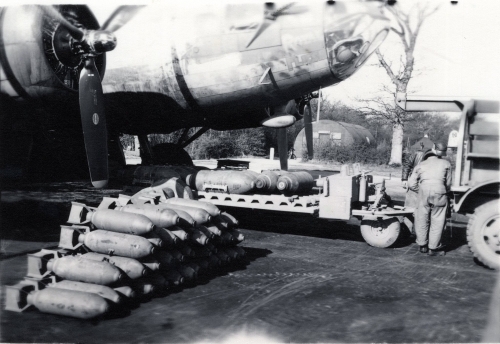 Apr 19, 1944 Lippstadt & Werl, Ger,  Target an airfield. Flew with Forsythe, darn good Crew. was hit. Thank god I've finished. 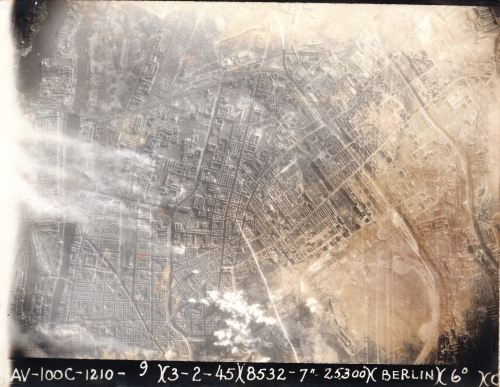 that Rosenthal flew on both 7th May and 24th May missions to Berlin. which yield and confirm the full crew list on either flight. of the actual date of the incident -- however, he thought it was late May. by him that he had finished flying and only had a ground job. the first confirmed flight being on 19th May (Berlin)." probably flying P-47s on May 7th/"
May 24th. Ray Bowden states that he did and with the Kincannon crew. but I'm very curious and would appreciate your assistance. 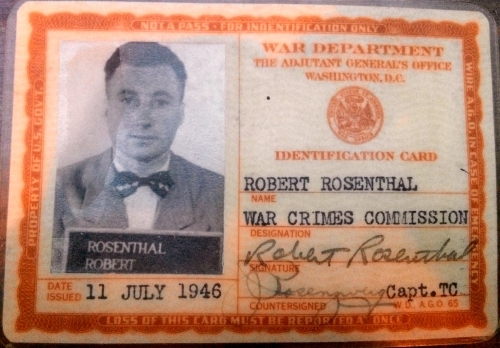 ROSENTHAL--Robert (Bob), beloved husband of Phillis (Heller), devoted father of Peggy, Steven (Barbara), and Dan (Paula), loving grandfather of Joshua (Julie), Katie, Joanna, and Sam, adoring great-grandfather of Alexi and Madeleine. 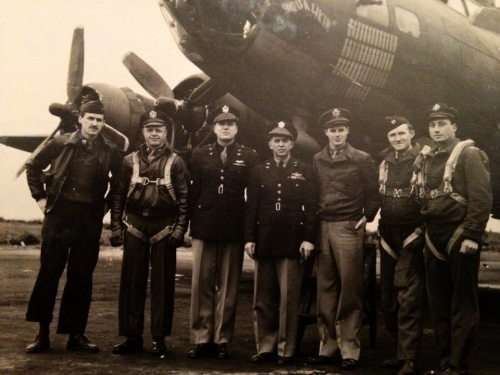 A retired lawyer and highly decorated WWII B-17 pilot. Died April 20, 2007. Services 2PM Thursday at Community Synagogue of Rye. Interment Sharon Gardens Cemetery, Valhalla, NY. Donations may be made to UJA or White Plains Hospital. Published in the New York Times on 4/25/2007. MESSAGE: My Uncle Bob passed away last week. I wasn't sure if anyone notified you. “For extraordinary heroism in action against the enemy on 3 February 1945 while serving as Air commander of a Heavy Bombardment Divisions formation attacking the Templehof Marshalling Yards, Berlin, Germany. 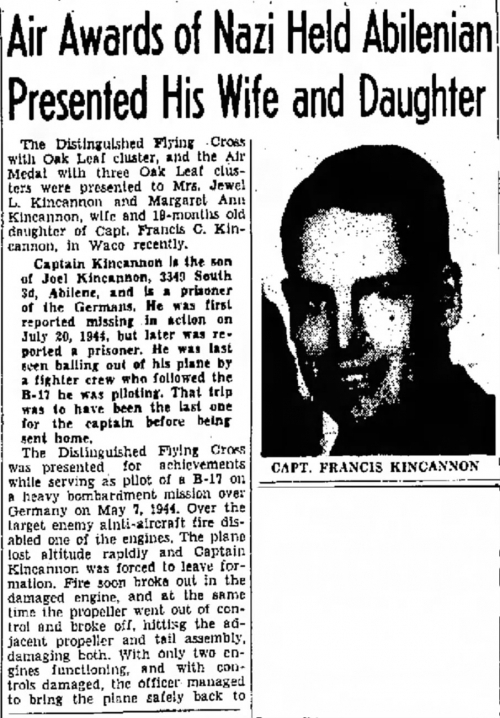 On this date, while on the bombing run, his aircraft suffered a direct hit by enemy-aircraft fire which inflicted severe damage on the plane and started and intense fire in the bomb bays. Completely disregarding his personal safety and in spite of the imminent danger of explosion, he continued to lead his formation over the target. 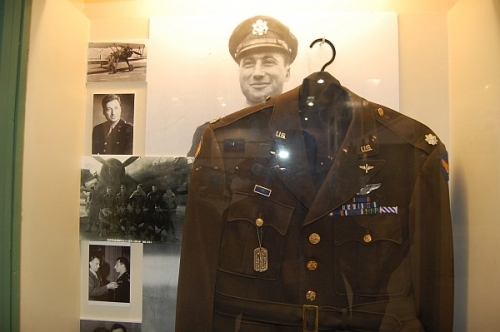 The extraordinary heroism, skillful airmanship, and intense determination to complete his assigned mission displayed by Lt. Col. Rosenthal on this occasion are in keeping with the highest tradition of the Armed Forces of the United States. First Lieutenant, Army Air Forces, United States Army. 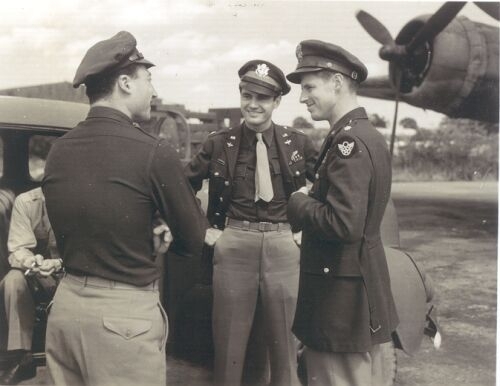 For gallantry in action while serving as Pilot of a B-17 airplane on a bombing mission over Germany 10 October 1943. 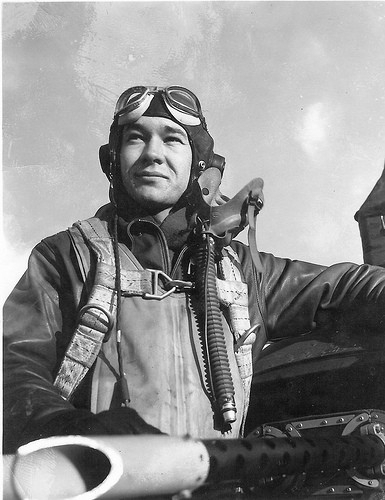 Prior to reaching the objective, one engine of his aircraft was knocked out and other serious damage sustained during vicious assaults by enemy fighters. 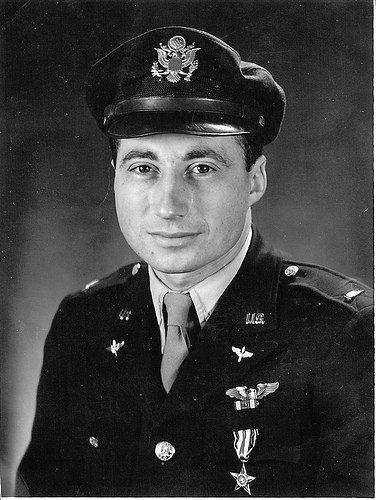 Thought subjected to constant attack and intense anti-aircraft fire, Lieutenant Rosenthal continued on to the target and bombed and bombed it successfully. When unable to remain with the formation on leaving the target area, his aircraft became the object of concentrated attacks by enemy planes. Another engine was knocked out, the oxygen system almost completely destroyed, the wing badly damaged and two gunner seriously wounded. 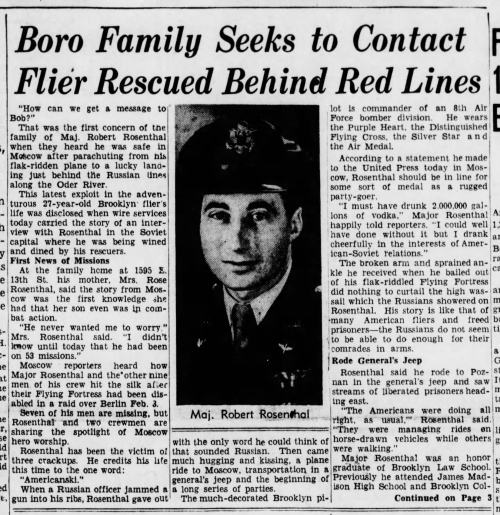 Maneuvering his crippled aircraft with great skill, Lieutenant Rosenthal fought his way back to England and made a safe landing. 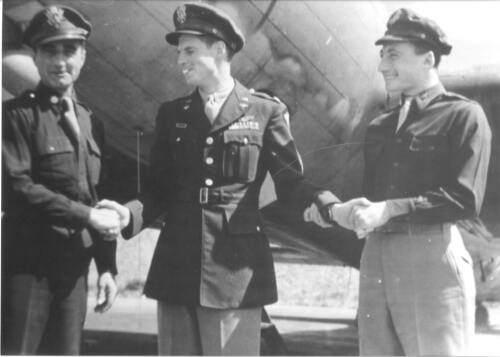 The gallantry, tenacity of purpose and flying skill displayed by Lieutenant Rosenthal on this occasion reflect highest credit upon himself and the Armed Forces of the United States. For gallantry in action while piloting heavy bombers over enemy territory from 3 October 1943 to 10 September 1944. 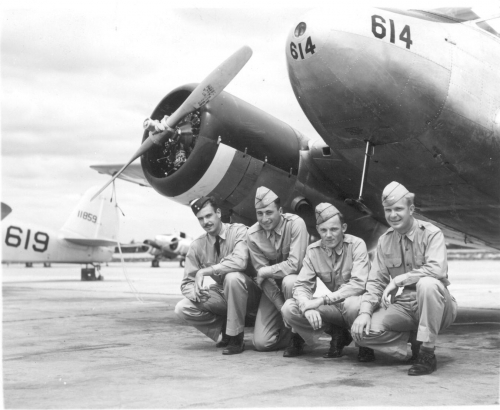 As, Combat Pilot and later at various times, Lead Pilot for his Squadron, Group and Combat Wing. 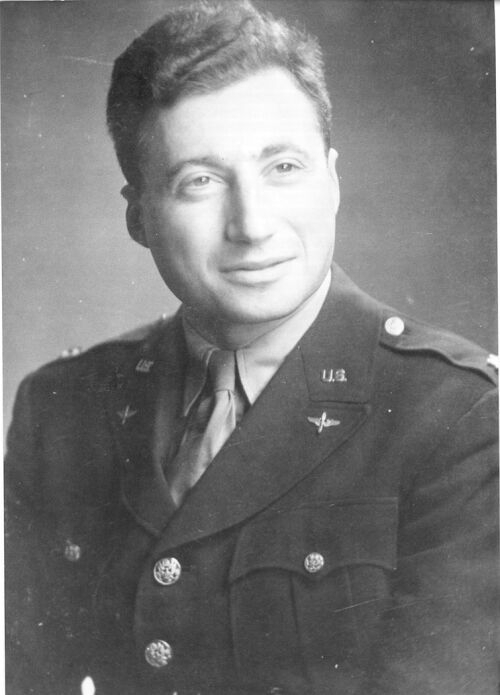 Major Rosenthal completed an unusually large number of hazardous missions. On 10 September 1944, while over Germany enemy ground fire knocked out two engines and heavily damaged his aircraft. Alone and unescorted, he skillfully maneuvered his battered plane back to friendly territory, where he made a successful crash landing. 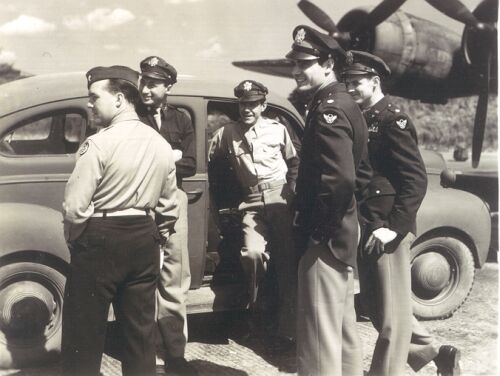 In the face of determined opposition, Major Rosenthal’s complete disregard for personnel safety, devotion to duty and combat skill have been a constant source of inspiration to all flying with him. 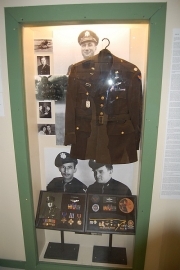 For extraordinary achievement while serving as Pilot of a B-17 airplane on Twenty-five heavy bombardment missions over enemy occupied Europe. 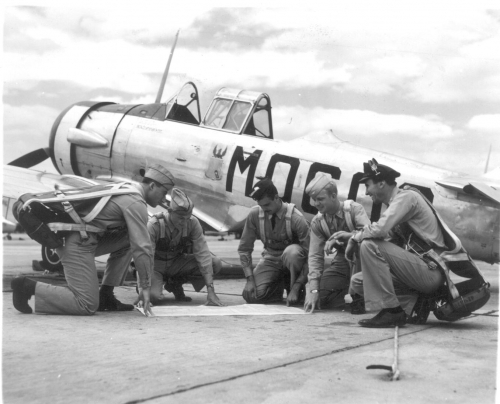 Through the skillful handling of his aircraft in aerial combat. 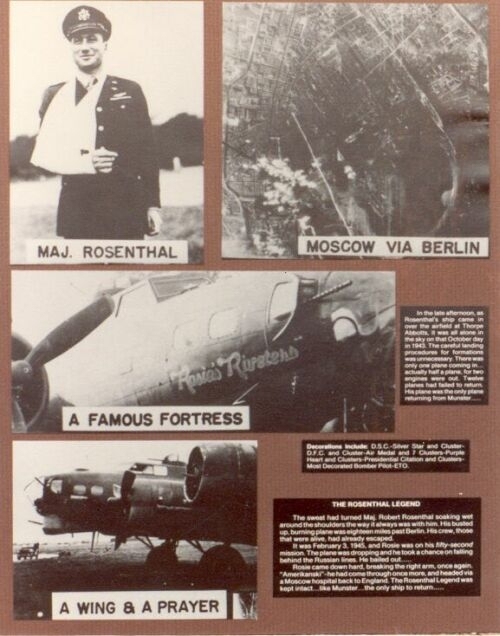 Captain Rosenthal has materially, aided in the success of each of these twenty-five missions, among which were the operations over Brunswick, Germany 21 Feb 1944, Regensburg, Germany 25 Feb 1944, and Berlin, Germany 8 Mar 1944. 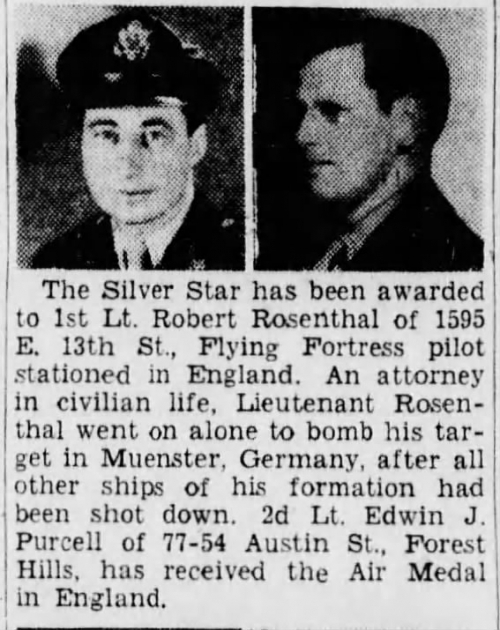 The courage, coolness and skill displayed by Capt Rosenthal on all these occasions reflect the highest credit upon himself and the Armed Forces of the United States. For extraordinary achievement while serving as commander in the air of group and wing formation on heavy bombardment missions against the enemy. 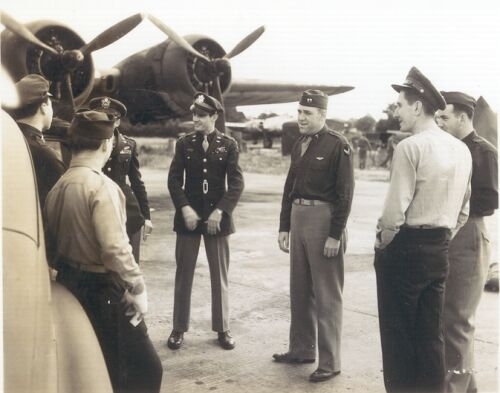 In surmounting the obstacles of intense anti-aircraft fire on both occasions Major Rosenthal demonstrated outstanding airmanship in commanding his formation on successful attacks against Munich 12 July 1944 and Magdeburg, Germany, 5 August 1944. 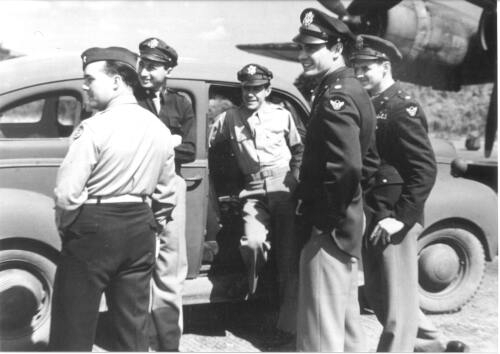 Major Rosenthal’s forceful leadership and flying ability materially aided in the successful completion of these important missions. His actions reflect the highest credit upon himself and the Armed forces of the United States. Under the provisions of Army Regulation 600-45, 8 August 1932, as amended and pursuant to authority contained in Section I, Circular 36 HQ ETOUSA, 5 April 1943, and teletype S1632C HQ VIII Bomber Command, 26 September 1943, the Air Medal is awarded to the following-named officer. Citation:  For exceptionally meritorious achievement, while participating in five separate bomber combat missions over enemy occupied Continental Europe. The courage, coolness and skill displayed by this officer upon these occasions reflect great credit upon himself and the Armed Forces of the United States. 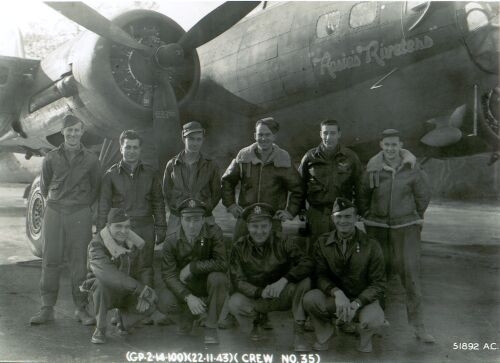 Robert (NMI) Rosenthal, 0-792349, 1st Lieutenant, 100th Bombardment Group (H), Army Air Forces, United States Army. 1. The War Department is in receipt of confirmation of the award to you of the Distinguished Flying Cross by the British Government. 2. Acceptance of this award has been approved and the approval made a matter of record in the War Department. 3. This Office has been informed that the British authorities are making arrangement for all decorations which were not presented in the field to be presented at a future date in an official and ceremonial manner. You will be informed of the date and place of the ceremony. 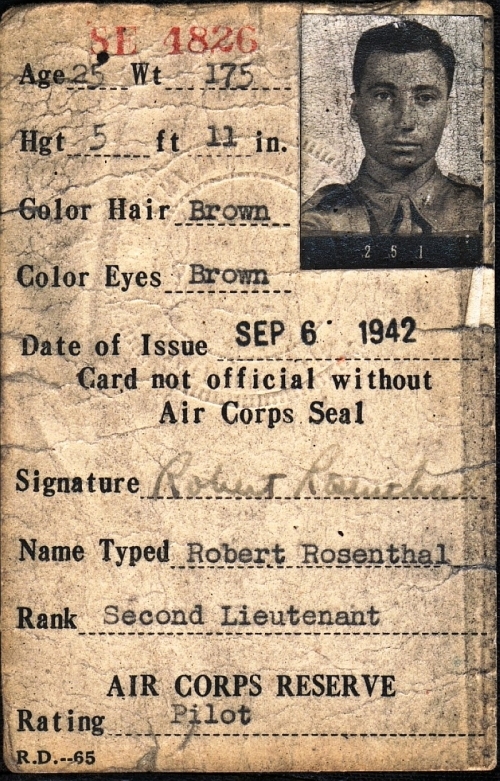 2nd Lt. Robert Rosenthal's 1942 Identification card. 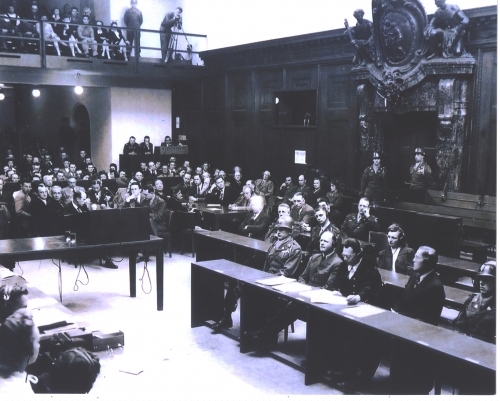 Robert Rosenthal at Nurnburg War Crimes Trial . 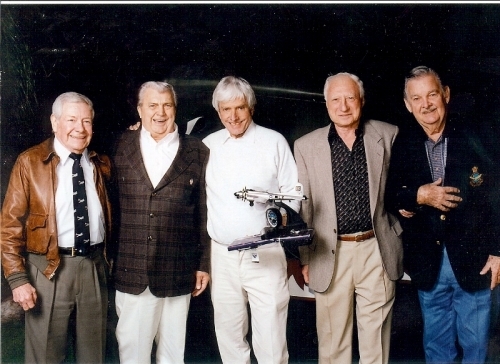 Thomas Jeffrey, Rick Erickson, Dave Tallichet, Robert "Rosie" Rosenthal, Charlie "Hong Kong" Wilson. This PFF was flown by Robert Rosenthal and featured in the July 44 Yank Magazine Article. 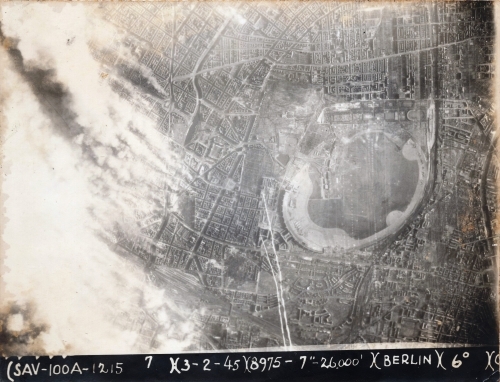 Date of Mission is May 7, 1944 and target was BERLIN. Royal Flush on Hardstand 47. Photo courtesy of Eileen Potts Smith. Rosie's Riveters II on Hardstand 43. In background is Messie Bessie X  238175. LD-O. 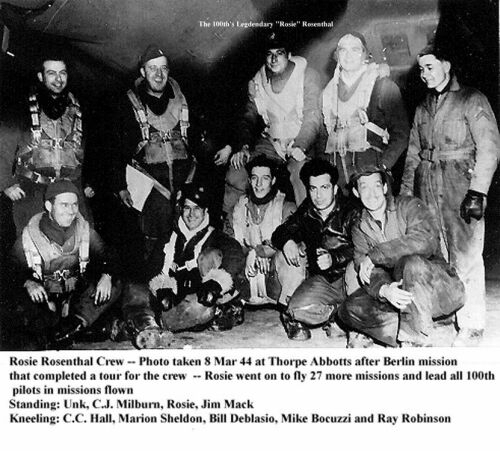 Photo believed to be taken March 8, 1944 after Capt Robert Rosenthal's Crew returned from BERLIN to complete their tour of 25 Missions. Photo Courtesy of Eileen Potts.